It is no secret that social media is taking over all our lives. In the wake of recent scandals, perhaps most notoriously that of the company 'Cambridge Analytica', this is more concerning than ever. Quite aside from addiction, data manipulation and fraud, how is this impacting our day to day lives? Let's put international politics, and some of the most shocking votes in history to the side for a moment, and get down to the real questions: do you text them or do you not? Dating in the 21st century is a political minefield; how anyone successfully navigates the unspoken 'rules' and changing language is beyond me. I mean what is the difference between a date and dating? Or dating and 'seeing someone'? Or seeing someone and being in a relationship? The list and the confusion goes on, but all of this is exacerbated by social media. With messages online, there are an endless number of ways you can interpret the words staring back at you on the screen. This can add a great deal of unnecessary stress into our life, as we are constantly aware of our crush's activity but not actually with them. Information you could normally have only got from stalking, is not quite happily in the public domain. You can see where they are, what they're doing and who they're hanging out with. You can also see when they've read your messages, when someone is typing a response and now (thanks iphones!) even when they are re- reading messages. This is way too much information. The problem is that once you know you can have it, it's hard to opt out. I wouldn't choose to have access to this much information, but when it's, quite literally, at my fingertips I find it hard to ignore. The reason we have all this information is, of course, that is massively fuels our addiction; which is great for people designing updates on all our favourite apps and for those advertising in these spaces, but is not so great for our mental health. The obvious thing to do would be to 'check out' for a while, and many of us do. Somehow, that feels a lot harder when you have a crush, however, because the buzz of messaging can be hard to resist. It feels so harmless: you enjoy the flirting, getting a message from them makes you smile, it makes you happy so why not do it? The problem is when the pattern of messaging starts to spiral. You may know it's ridiculous but not getting a message from the person you like can massively impact your mood. Hell, even the wavering three ellipses can be toe clenchingly agonising at times... Either they reply, then you do, the cycle continues and you find yourself constantly checking your phone OR they don't reply and, if you're anything like me, you sulk. I've been living with this since high school; god help those who are experiencing it even younger. We can talk about detoxing from social media as much as we want, and I really admire those who can do it, but my life is on my phone. 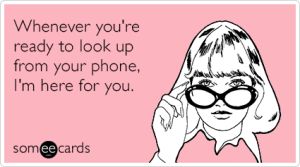 I'm exaggertaing of course; I'd have a wonderful life without my phone, but it really does enhance many aspects of it. I work several jobs so being able to flick between emails on the go is incredibly useful and means my life is ever changing and exciting. I have friends all around the world who I love, miss and want to keep in contact with. Every newspaper I wish to read has an app providing me with updates on events I care about and actively choose to follow. The problem is that in between the emails, messages and stories are those three dots that drive me insane. Finding the right balance can be incredibly difficult because there's that constant fear of missing out. You could leave your messages and talk to the real people around you... but what if this particular conversation is the one that leads to the first date? It's the what if factor around social media that makes it so intoxicating, especially when it comes to romance. Ultimately, of course if you have the willpower to leave it alone: run for the hills. Find alternatives. Be free of it.